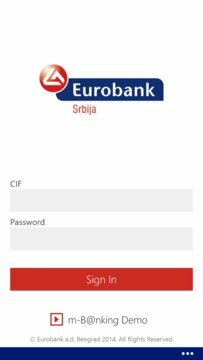 Eurobank Serbia presents m-B@nking application that allows you to perform all banking transactions using your mobile phone, in a completely safe manner. • use loan calculator for different types of loans. Service activation is free of charge. The request to use the m-B@nking application can be submitted in any Eurobank branch throughout Serbia. The only requirement is to have a Eurobank current account package opened (EuroPlata, Euro Plata premium, Euro Plata Gold, Exclusive Package or the Golden Age package). After submitting the request in any of the Bank’s branches, you will receive an activation code. 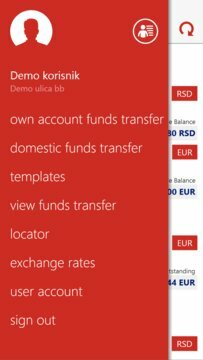 Next step is to download and install the application "Eurobank Serbia m-B@nking" from the Windows Phone Store, and then enter previously received activation code. Upon successful activation of the service, it is essential that you create your own password for future usage of this service.